Artotel Wahid Hasyim just newly opened this month and had their grand launching on 12th April 2019. 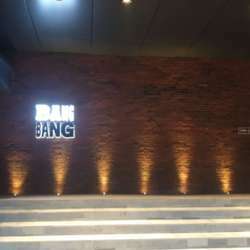 BANG BANG restaurant & bar is located on the ground floor (lobby level) of the hotel and offers refreshing cocktails, drinks and serves coffee shop style burgers and finger food. For directions, kindly call : 021 3989 9022. Your entrance fee includes 1 Welcome Drink Voucher (from a choice of Wine, Vodka, Gin, Beer, Soft Drinks) and 1 Appetizer Voucher for a plate of appetizers. BANGBANG will offer Happy Hour prices on selected drinks from the bar from 7 to 10 pm. BANGBANG's resident band BUMPZ will play TOP 40's music to entertain us 9 pm onwards. ARTOTEL Wahid Hasyim is generously providing Lucky Draw Prizes: 2 Vouchers value IDR 250.000 each. Get ready for some fun, drinks, snacks, dance and party time!